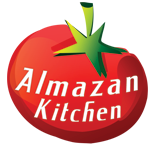 This is a new record for AlmazanKitchen – 75 days old meat for steak! In this best steak recipe, we ever made, you will find juicy dry aged pork cooked on the special clayware grilling plate with aroma of garlic cloves, rosemary and chili. We prepared for you the best possible garnish for the steak – fresh veggies: organic tomato and zucchini. The sauce part is something – Serbian special guacamole! Preheat clayware cooking plate, grease with canola oil. Slice one chili pepper, unpeel 3 garlic cloves and toss it into the cooking plate. Add few aromatic rosemary sticks. Place dry aged pork chop onto the cooking plate, cover it with lid and let it stew for a few minutes on low-medium fire. Then flip it and repeat step #3. While chop is stewing, we can make a Serbian guacamole. Toss handful of dill & parsley into the mortar, slice bell pepper and toss that bad boy into the mortar too. Add 1 tbsp. of vinegar into the mortar, pour with olive oil and salt to taste. Remove the seed and unpeel the avocado. Slice it and toss it into… well, you know where, right? It’s time for good ol’ smashing. Smash everything in the mortar using pestle, smash it well then mix for good. Slice zucchini and tomato into the rounds. Grill it with the steak constantly flipping until golden brown texture. Grill steak on low fire for 5-8 min each side, check it, it should be white inside. When almost ready, place 1 tbsp. of guacamole under and on top of the steak.